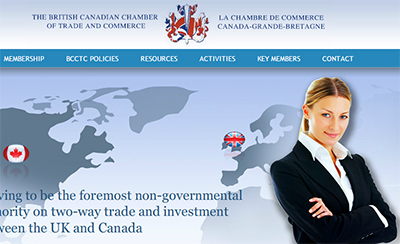 The British Canadian Chamber of Trade and Commerce. Ready to welcome you with folded arms! Today it’s the British Canadian Chamber of Trade and Commerce (BCCTC). How can you help Brits moving to Toronto set up their own business or find work? BCCTC can provide you with information on what the necessary steps are to start your own business (export – import – investing). We can advise you on who to contact and how you can get help in everything you need, i.e. registering your business, doing the necessary market research, branding and marketing, trade and logistics, accounting and legal needs, via our members and — most importantly — we can connect you with your future clients! We have close ties with the Ontario – Federal – Municipal governments plus various agencies. For people looking for work, we can recommend centres that can help; we sometimes receive inquiries from our members looking for people, and although this is not our focus, we will try to help. Is it better to get in touch with you from the UK or once arrived in Toronto? From the UK is better, time wise, as we have members who help people and businesses in their transition to Canada, so we can give some recommendations in that area as well. We can start learning of their needs and how best we can provide assistance, with reasonable notice. You get no funding from the British/Canadian governments … how do you get financial support? We are fully self funded with our events and by membership, details here. You have quite an active events calendar — is that the best way for Brits to network with each other, or do you run a LinkedIn group or anything too? In our events calendar we publish all events also hosted by our partners: British associations in Canada, the UK and the US, European chambers, and business events that we think are of interest to our members. We believe we are the most international chamber of commerce in Toronto. Even though our focus is primarily business events, we also promote British social events, via our membership of the “Loyal Societies” (an association of 17 British organizations in Toronto, to name a few: Freemen of the City of London, North American Branch, Monarchist League of Canada, Toronto Branch, St David’s Society of Toronto, St George’s Society of Toronto, etc.). We also have an active social media presence with a LinkedIn group, Facebook page, and Twitter account. Any other information we should know to help Brits in Toronto be successful? Even though Canada is very similar to the UK there are subtle differences, which we can help you learn and overcome. We are recognized as a friendly as well as active chamber. This entry was posted in Uncategorized and tagged bcctc, british canadian chamber of trade and commerce, brits in toronto on April 13, 2015 by britsintoronto.